Tenant screening is a mandatory task that every landlord has to and should go through. Although it is one of the most tiresome tasks of the entire tenant searching process, but in our opinion it is the most crucially important as well. During tenant screening, landlords are required to perform a variety of inquiries regarding the information provided by the tenants about their personal life and professional/financial status. Each of them is equally important but the most crucial one is the financial and employment related aspects. Every landlord must make sure whether the prospective tenant has provided authentic information about his/her income and employment or not. If you ignore this aspect then you might have regret it later on after handing over your property because the tenant may or may not be able to pay full rent or has an unstable source of income. Furthermore, it is also important to verify the legitimacy of tenant’s occupation, that is, if he/she has a legal job and is not a criminal or drug dealer. People might be involved in shady businesses and need to find a decent rental unit to secretly perform their illegal activities without generating suspicion. 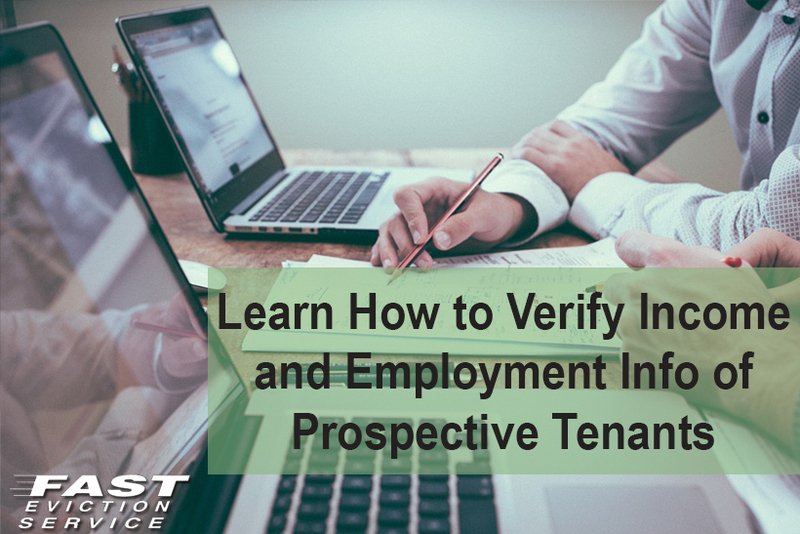 Therefore, it is very important to verify the income and employment information of prospective tenants. But, how can you do so? Pay stubs: it is probably the simplest of all documents that you can request for. Ask for paystubs from the past two to three months as the document will contain the list of income starting and ending date. This way, you will get an idea about the weekly, monthly and annual income of prospective tenant. The document will also show gross and net income (after taxes) of the tenant as well as the year to date earnings. W2s: To be very sure about the tenants and as an additional layer of authentication, landlords can ask for copies of W2 form to check how much income the tenant has declared for the previous tax year. You will be able to ensure if the tenant has a stable income or not by analyzing past year’s income. Bank Statements: Understandably, self-employed individuals cannot present pay stubs; therefore, your best bet is to ask for bank statement copies to verify their income stability. Remember that you need to request for bank statements of at least 3 to 4 months to get a clear picture of the mean monthly income of prospective tenants. File Form 4506 With the IRS: It is a commonly observed norm that landlords avoid renting their property to self-employed individuals probably because they cannot fully verify their income. However, you have the option of Form 4506 to the IRS, which will help you in getting a fair idea. It is a request for receiving a copy of the federal tax records of the tenant. There is a downside though; you may have to wait for as long as 60 days to receive the copies; it is a untiringly slow process that takes weeks and sometimes even months. Obviously waiting this long for copy of federal tax records is impractical as nobody would leave the property vacant for months. Moreover, you will have to pay a fee of $57 for receiving the copy. There is a better option in this context; you can request for Form 4506-T. It is basically a request for the tenant’s tax returns transcript. It will be a speedy process since it takes only one business day to receive the document and the required information will be provided to you. Applicants who have an employer are easier to verify as there are more than one ways to do so. One such way is to contact their employer and countercheck their employment information. Directly speak with the employer and ensure that the applicant works there as he or she is claiming and the income amount is same as they have told you. To get in-depth and comprehensive insight into the financial status of the prospective tenant, you must run a credit check on them. This will inform you if the applicant has fulfilled all of his or her financial obligations and also you will get to know the credit score, debt related information and if the applicant has ever filed for bankruptcy. It will also provide valuable details about any previous eviction and judgments against the applicant. After gaining information about the debt it is important to compare the applicant’s total debt to his/her income. This is called debt to income ratio. For instance, on paper the applicant might be earning $40,000 per year but he/she also has a debt of $40,000. This would mean that the applicant may find it difficult to pay their monthly rent. Another important piece of information that you will receive from running credit check is that whether anyone else has checked for the applicant’s credit or not. However, the downside is that you cannot get information about applicant’s previous and current employers. Usually, employers run a credit check before they decide about hiring an individual. This is why the credit check will show information about all the employers who checked the tenant’s credit in the past months. However, checking the credit and hiring the applicant are two different things. It is not necessary that whoever ran credit check also hired the individual. To determine the companies the applicant was actually employed previously you need to contact the employer directly. Nowadays, it is very important to verify the claims made by an applicant on your own without involving any outside source. Researching about the prospective tenants is necessary because it will help you enjoy peace of mind later on.